Roasting the grapes was a breeze. You coat them with olive oil, pop them in the oven for several minutes until lightly browned and wrinkled, and then toss them with balsamic vinegar and chopped rosemary. Both the grapes and the oven-toasted baguette slices can be prepared several hours ahead– a big make ahead bonus! I took these openers to a dinner party last weekend, arriving with a big tote containing the roasted grapes, cheese, and toasts. It took only a few minutes to assemble the appetizers and arrange them on a platter. Then I watched with a smile as they quickly disappeared! 1. Arrange a rack at the center position and preheat the oven to 350 degrees F.
2. Place the grapes on a rimmed baking sheet and drizzle them with 1 1/2 tablespoons of olive oil. Stir, using a wooden spoon to coat well. Roast, stirring once or twice, until the grapes begin to wrinkle, are slightly browned, and some have collapsed, 15 to 18 minutes. Remove them to a bowl and toss with the balsamic vinegar and the rosemary. (The grapes can be prepared 3 hours ahead; leave at room temperature.) Retain the oven temperature. 3. For the toasts, arrange the bread slices on another baking sheet, and brush on both sides with olive oil. Bake them until slices are crisp and golden, about 4 minutes per side. Remove and if not using immediately, leave at room temperature uncovered for up to 1 hour. Cooking tip: To toast walnuts, spread on a rimmed baking sheet and bake in a preheated 350 degree F oven until lightly browned and fragrant, 6 to 8 minutes. Remove and cool. 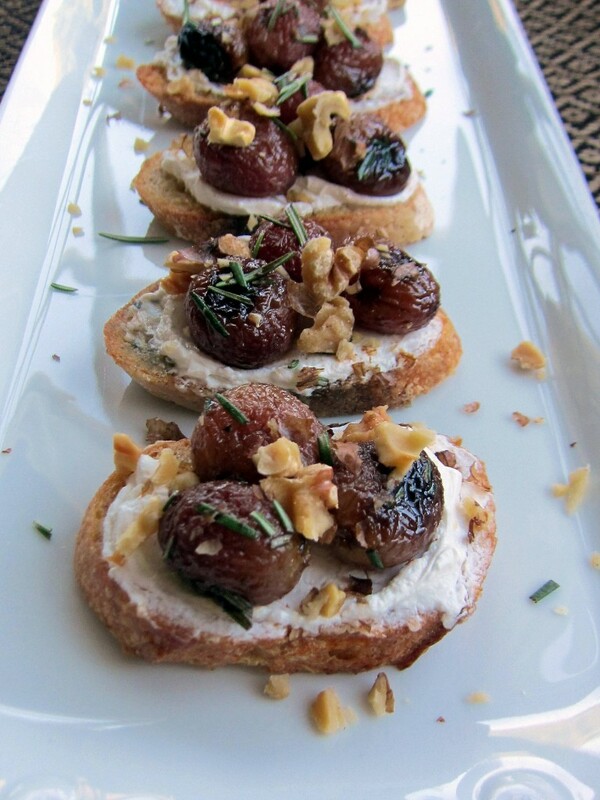 This entry was posted in Food News and tagged appetizers, fall, goat cheese, roasted grapes, walnuts by brosbottom. Bookmark the permalink. How much balsamic vinegar do you use? 1 1/2 tsp and please excuse this omission! I’ll correct it asap! Barbara, Your note made my day! I’m so glad you tried those roasted grape toasts! We had company for drinks this weekend too and guess what I served– the same thing! Thanks so much for writing and hope to see you soon!! This recipe saved the day! I enjoy Betty’s blog posts and always get excited to see a new recipe. I wanted to prepare this since the day it was posted, but fall is just so busy for me. Yesterday, I returned from the grocery store and not 3 minutes after my arrival, my husband announced that he invited friends over. My initial panic turned to joy when I realized that I always, have a nice baguette, creamy goat cheese, and red grapes in the house. Rosemary is still kicking in the garden and I have a beautiful balsamic I save for special occasions. So grateful to Betty for this recipe which turned every day ingredients into a fabulous appetizer. It was a huge hit and is as beautiful as it tastes.